Next week in Houston, a very interesting exhibition is set to take place. No, it’s not jet cars this time. It’s something from a whole different corner of the drag racing universe. Drag racing is actually quite the diverse sport and it takes many different forms on many different levels. In this space, we usually talk about the NHRA, which is a highly organized, and essentially highly corporate organization. It’s tightly controlled and features specific classes and rules. It is, if you will, the top of the professional ladder, and in many cases it requires the extremely high level of financial support you would expect from a top level racing organization. High dollar means corporate America and all the sterilization that can oftentimes go along with that, not just in NHRA, but in NASCAR, IndyCar or any other upper echelon and expensive form of motorsport. Nitro cars are exciting and NHRA, of course, has many fans, but this form of drag racing is not for everybody, and there are many other styles to choose from. NHRA has a Pro Mod class but these styles of cars can be found racing in other sanctions like PDRA too. If you like small tires better and enjoy drag radials, you can check out NMCA where they feature a radial class, or look out for any of the many stand-alone events for these cars, like Donald “Duck” Long’s big races, Lights Out and No Mercy. If you really want something a little edgy, No Prep racing is on an upward trajectory. This might be about the farthest afield you can get from the polish of the NHRA, as the No Prep world tends to feature former (or current?) street racers, “Street Outlaw” types if you will. Rules are not quite as tight so the cars tend to come in lots of configurations, except for Pro Mods, which have been banned from many of the No Prep events as of late. No fancy team uniforms or million dollar haulers here. So it’s an interesting combination that next Friday in Houston, in and among all those professional teams, eight of the fastest small tire No Prep racers from the Redemption series will run an exhibition race. The drivers will make one qualifying pass first thing Friday morning, then return for the first elimination round at 1:30 p.m. They will take the big stage so to speak as the semifinal and final rounds will run prior to the two Friday qualifying rounds for the Mello Yello Pro Series. It’s a huge opportunity for these racers to play their game in front of a much bigger piece of the drag racing fan base then they are used to. It’s a great way for the Redemption series to grow its fan base. 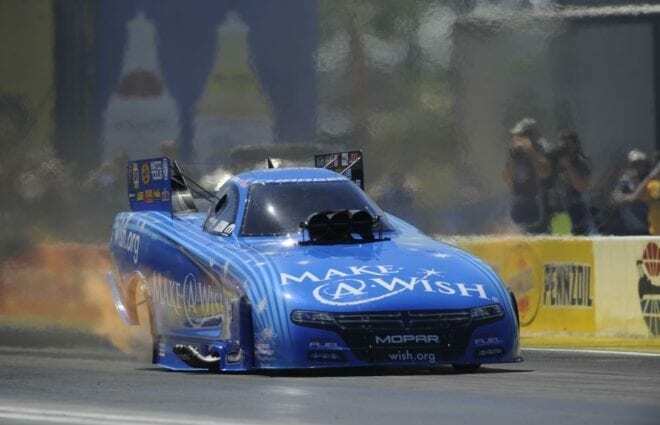 It’s also an effort on the part of the NHRA to bring together two very separate corners of the drag racing world to see if it will stick and hopefully benefit both sides. I’m an oddball and I know it. If there are two of them going down a strip side-by-side, I’m in. There’s room in my heart for Pro Mods, radial racers, No Prep, PDRA, NMCA, Redemption, Lights Out, Outlaws, NHRA and pretty much anything else you can think of. I realize that I’m odd however. I realize there are those fans on the NHRA side who consider the No Prep racers to be the sketchy dregs of the drag racing barrel and there are those in other corners of the drag racing world, not just No Prep, who consider NHRA to be the corporate, over regulated, politically correct, out of touch side. It will be interesting to see how those two very different ends of the drag racing spectrum come together next week. *Shawn Langdon has a new drag racing home once again. Langdon joined Don Schumacher Racing full time last year after finishing out the 2015 season with the team. His former team, Alan Johnson Racing, struggled to find sponsor support and eventually closed down operations, prompting the move to DSR that was initially temporary. This year Langdon found himself once again facing a lack of financial support, keeping him off the track so he has found a move to a new team to be the answer. Langdon has moved to Kalitta Motorsports which will immediately expand to three Top Fuel entries. 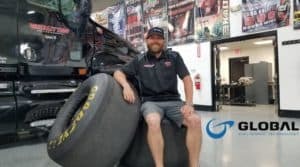 Langdon will drive the Global Electronic Technology dragster alongside Top Fuel teammates Doug Kalitta and Troy Coughlin Jr.
Don Schumacher Racing hit a huge milestone, scoring the 299th and the big 300th win in the organization’s history at Las Vegas. Celebrate all of those wins in pictures while team owner Don Schumacher shares a few memories from over the years in this video.